First day of plant ID – along a roadside in the Bighorn Mountains near Sheridan, WY. Dichotomous key: Is the inflorescence a spike, raceme, or panicle? Yale graduate students: What on earth do those words mean? Sheridan undergraduate students: An inflorescence is a group or cluster of flowers arranged on a stem that is composed of a main branch or a complicated arrangement of branches. A raceme is an unbranched type of inflorescence bearing pedicellate flowers, whereas a panicle is a loose, branching cluster of flowers, and a spike is like a raceme, but the flowers develop directly from the stem and are not borne on pedicels. Gosh, were you guys born under a rock? 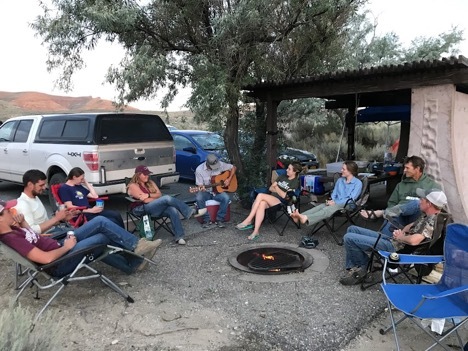 All jesting aside, one of the best parts of Ranch Crew was the opportunity to learn alongside Jordan, Jaycie, and Tyler of Sheridan College and the University of Wyoming. If you’re ever playing rangeland trivia, you want them on your team. Line-point intercepts at Currant Creek Ranch. 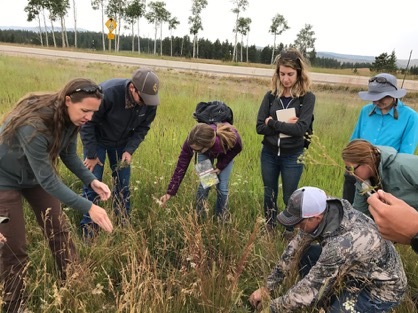 The second week of Ranch Crew, we put our plant ID skills to the test at Currant Creek Ranch near Rock Springs, WY. There, we followed the ranch’s namesake creek through the bottom of a wide river canyon. 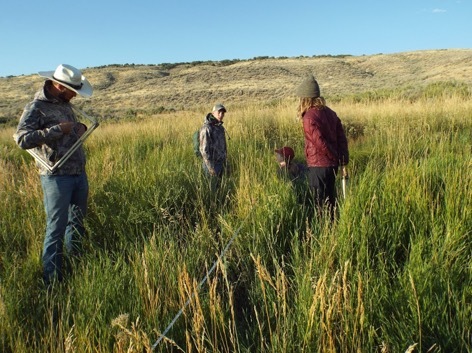 To determine the percent cover of plant species (and the basic plant communities) within the ranch’s riparian zone, we used a point-line intercept method. First, we selected a random starting point at the northwestern end of the property and used a measuring tape to create fifty foot transects perpendicular to either side of the stream bank. Then at each foot marker, we lowered a wire pin flag to the ground – recording the species that the tip of the pin hit first as “aerial cover”, and what the tip on the ground hit as “basal cover”. We then paced off [1,000] steps upstream to our next transect point and began again. We spent four long, beautiful days at Currant Creek Ranch. 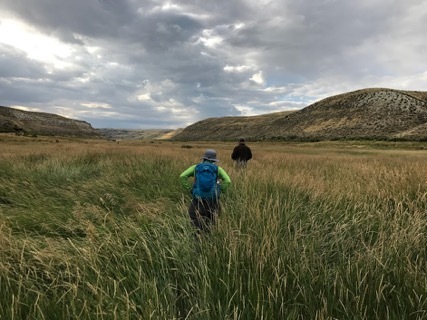 By the time our fieldwork was complete, we’d identified over 2,000 plants and tromped almost ten miles through the property. We could reel off 20-50 species each, and the rest we could find within the pages of our dichotomous keys. This information is at the heart of the Rapid Assessment of Currant Creek Ranch that we currently developing, which will be shared with the landowners next month. This entry was posted in Botany, Ranch Crew, Ranch Crew 2017 and tagged Katie Panek. Bookmark the permalink.